"A hero should never have to stand alone." 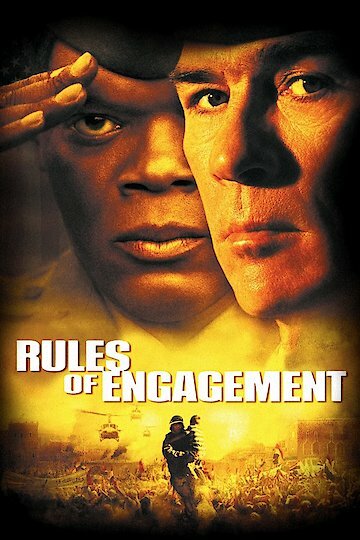 Rules of Engagement is a courtroom thriller that redefined the genre. Colonel Terry Childers, played by Samuel L. Jackson, is a thirty-year Marine veteran with combat experience in Vietnam, Beirut and Desert Storm. Despite being a decorated officer, his country has put him on trial for a mission that did not go as planned. Called into action by a riot, Childers evacuates an Ambassador’s family. However afterwards, Colonel Childers ordered fire on the surrounding crowd with the thought that the men were armed. In total, over 80 men, women and children were killed and several hundred others wounded. The leadership and mental abilities of the Colonel are brought to question and justice lays down its hammer upon his head. Back in the USA, officials fear a backlash from foreign dignitaries and choose Childers as a perfect scapegoat for the incident. Colonel Hayes Hodges, played by Tommy Lee Jones, is chosen as Childers’ attorney. The two men fought bravely together and Hodges owes Childers his life. Hodges takes the case reluctantly, but soon begins to doubt the integrity of the man who saved his life so long ago. While not the most experienced or talented attorney, Hodges bravely faces very critical prosecutors and ever-shifting mounds of evidence. Throughout the film, the view shifts from the courtroom setting to the battlefield. With each shift, the viewer questions the mentality and leadership of Childers until the final verdict is given. Energy is brought to the courtroom setting with driving topics, shifting views, and a true test of friendship between the two Colonels. At many points, politics and the ever grey military morality are brought into the light and left out for the audience to think about what it means to be a solider in a time of war and confusion. The lead actors play extremely well off of each other giving the entire movie a strong sense of accomplishment. Rules of Engagement is currently available to watch and stream, buy, rent on demand at FlixFling VOD, Amazon, Vudu, Google Play, iTunes, YouTube VOD online.